Considering that tooth enamel is even harder than bone, it might seem indestructible. If that were the case, however, you wouldn’t need dental care. Proper oral hygiene habits are a vital component of maintaining teeth and gums. Sometimes, whether due to aging, trauma or decay, you can experience tooth loss that affects your self-confidence. With restorative dentistry services at East Adelaide Dental Studio, you can regain your smile. If you’re interested in replacing a single tooth, multiple teeth or all teeth, dental implants are the most advanced solution available. They’re often an ideal alternative to bridges or dentures due to convenience, a natural appearance and the decreased likelihood of further tooth loss. Once we’ve determined whether you’re a suitable candidate for dental implants, the procedure involves two separate parts, both completed at our practice. First, a screw is placed into the jaw that acts just as a tooth root would. After a healing period of about three months, you’ll return to have a restoration placed on the implant, restoring the function and look of your smile. The dentures of today aren’t like the ones in decades past. They’re comfortable, look completely natural and can replace all teeth or several missing teeth (full and partial dentures). 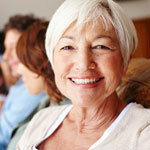 We offer dentures made in a variety of different materials to suit your preferences and budget. Crowns, also known as caps for the teeth, go over the tooth structure to strengthen a tooth that has been weakened by decay, trauma or a root canal. You can have a crown created and placed on the same day with our CEREC technology, making your visit an easy stop during the workday. 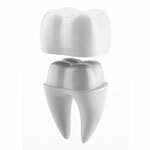 We generally recommend porcelain materials to make your crown that will blend in with the rest of your smile. e.max® is the material used at our practice, which is stronger than traditional materials for a durable, long-lasting restoration. 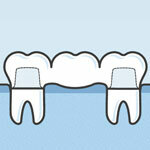 If you’re missing one tooth or multiple teeth, a dental bridge can fill that gap. 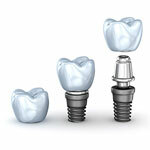 It’s made up of two crowns with an artificial tooth in the middle that’s suspended into the area of a missing tooth. After it’s cemented into place, it provides a permanent solution. First, we’ll evaluate you to ensure that this is the best option to meet your goals. Then, we’ll prepare the neighbouring teeth that act as an anchor for the bridge. Impressions and other data are gathered, and you’ll be given a temporary bridge to wear until your final device is ready. Find out more about restorative dentistry in Glenside by contacting us today! We’re in-network providers for Medibank Members’ Choice, Bupa and HCF.